On being asked at the makers/manufacturers forum, this is a thread dedicated to some aspects of the celtic sword. I have documented LaTène swords these last few years in the quest for more detailed data. Little by little my respect for those smiths who made these blades have grown. It is obvious they were great creators and keepers of highly developed forging traditions. In roman times that region was called Noricum, famous for swords and high quality steel. It is interesting to note that the centre of the LaTène area also coincides with what later came to be Passau, the famous blade making centre of the middle ages. The mark of Passau blades was the running wolf, a mark that was pirated by the makers in Solingen in the 13th century. One can contemplate if Ulfberth (Ulf- meaning wolf) might have been working in the Passau region and not the solingen are as is often surmised. Please note: that is only speculation on my part: a favourite fantasy. In most literature on the subject of celtic swords, you see some strange ideas continued. It seems the celtic sword is mostly described as having no point. Most blades I have seen do have an adequate point similar to those on mlater medieval blades. Those with blunt ends are in minority. Another aspect that is striking is the skill with how the blades are forged and ground. Roman historians describing the short-coming of celtic swords when encountering roman legionaires must be seen in context: Celtic swords were probably not meant to be used on armoured opponents. The blades show a high degree of specialization: slim dimensions, fine and thin edges and points that can be used in slashing cuts and thrusting attacks on opponents that have none or very little in the way of armour. Quick, precise swords meant to be used by expert swordsment in single combat betewwn equals (or to be used in terrorizing unarmored civilians, of course). This is very different from trying to hack into a line of heavily armed infantry with sturdy helmets and metal reinforced shileds. A highly specialized tool is bound to fail when put to use in a way not intended with the design. What would have happened if the highland scots were armed with small-swords instead of basket hilted broad swords? Would their charge have been as famous? 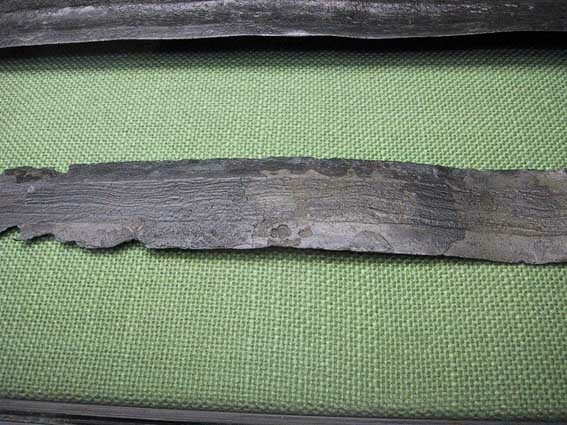 It is obvious they used a variety of iron alloys and steel to make most of the available material, yet it seems when analyzing surviving blades, that heat treating the steel was not very common. This is very strange, and I cannot help wondering about what methods and samples have been used to arrive at these conclusions. 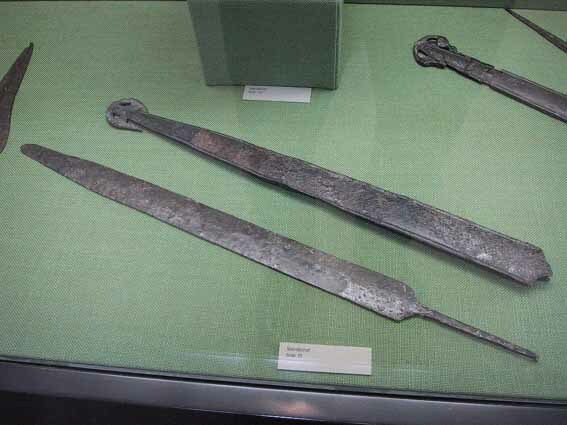 If I may again speculate, it may be that corrosion and ritual "killing" of swords by annealing could be the cause for the results showing only marginal or no heat treat. If the steel is low in carbon content and has a fine structure, we will only get a thin layer of hardened steel in the thinnest portions of the blade. This is also the parts that are most subject to corrosion. If the sections chosen for analyze is taken from a part of the blade closer to the hilt (where there is more healthy material left from corrosion) it would only be natural to find a lower amount of heat treat here. The point area would have had the higest hardness and as this is also the thinnest part of the blade, any corrosion here can have a big inpact on the results of metalurgical analysis. Testing of bronze age swords sacrificed in english lakes and rivers have shown that many were annealed before being thrown into the water. Annealed, but not bent! If bronze age smiths/swordowners knew about the damaging effects of applying heat to a fine blade, then surely it would have been known during the celtic iron age, one would think? Many steel blades show a fine pearlitic structure (unhardened = soft) which is exaclty what would have been the result if a blade was placed on hot glowing embers (a funerary pyre?) untill dull red and left to cool. This process would erase all previous traces of heat treat. Their structure and fine dimensions make it hard to believe no heat treating was used to make the thin edges harder and the slim spines more springy. Apart from the blades, the scabbards are also very skillfully made and show a great ingenuity in design, decoration and construction. what material I have collected is too small to show something other than a selection of various possibilities. 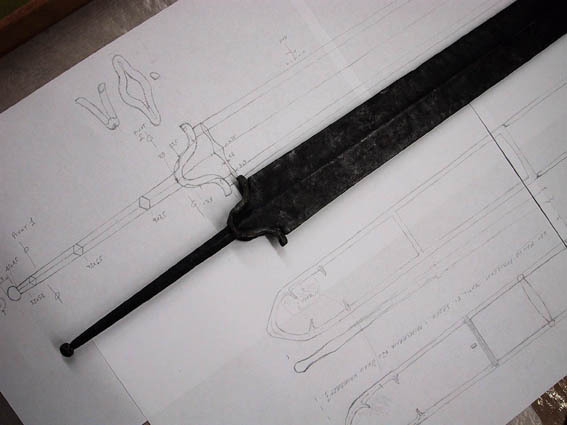 I gather information to base reconstructions on and to use as inspiration in designing swords. It is very different from the work done by an historian or archaeologist, who must look at the whole range of surviving material to draw conclusions. I can pick and choose those that I find interesting and inspiring. With that in mind the pictures might still be good illustrations of the variations of the LaTène sword. It would be great if others would like to comment and/or add material of their own to illustrate this topic. A nice short sword with a typical tapered point. A nice feature combining width in cuting area with a light and quick point. The shape allows for slashing attacks with the point as well. This is a sword from the Klingenmuseum in Solingen. It is slim and slight but have the same shape and proportions as bigger cousins of the same type. The cross section is crisp and shows some marks from forging. Thank you for your observations, its most informative. I think you hit the nail on the head with your insight and comments. on the same hilt (bronze pommel/guard with an organic grip)? Have you seen examples of solid bronze pommels and guards? yes it is common to mix materials. Wood (or horn?) could be used for the upper and lower guard and in some cases, as seen above, the grip can be made of bronze (and then typically hollow). The combination of (solid)bronze(or iron) upper and lower guards with organic grip is not very common, I think. I don´t know if I have ever seen an example of this. (If not the sword on the first pic below the one with hollow broinze grip counts...)The common practice is to use organic material for the hilt, with metal reinforcements. Coral inlays is popular on fancy swords. The antropomorphic hilted swords (daggers, really) have bronze, or sometimes iron hilts. You will not find a solid metal pommel to balance the blade as on swords from later periods. Celtic blades have a nice inherent balance of their own and are designed to have light hilts. How common it is to mix materials in the hilts? Well, he typical surviving LaTène sword looks rather like the one from Solingen: a small rivet washer, like a button, a bare tang and the little W-shaped mount at the base of the blade. There are some times thin washers that would have been mounted between grip, guard and pommel. To go further we have to make educated guesses. Usually you do not see so much metal in the hilts. Usually the blades survive with only minimal details of the hilts remaining. I think it is resonable to believe that wood and/or horn parts could have had some decoration as well. Perhaps not swirls as are incised on the scabbards, but well placed ridges and lines to make the shape more interesting. Contrast in shape and colour was a favourite theme in celtic art. A smooth well sculpted form in pommel and guard might also have been left alone to contrast agains the steel of the blade and patterns of the scabbard. While on the subject, here's a bunch of pics from the National Museum in Copenhagen, Denmark. There's more at http://62.242.233.116/kulturnet/. It's in Danish, but pick "Genstande", then "Vaben", then "Svaerd". Enjoy! Ah now THIS is the sort of thread I have been missing on the online fora of late! Excellent post Peter, raising many interesting points. I also feel we have very little variety in Celtic sword reconstructions. In fact, there are not very many options even of the "standard" double-lobed guards variety seen so often in sculptural evidence. A great note on the issues of points, also. Having recently (finally) gotten a copy of Navarro's catalogue of the actual La Tene swords, it becomes quite clear (and Navarro is quite explicit) that even amongst the La Tene B/La Tene II swords many, many had sharp points, capable of thrusting, and still quite sharp after eons submerged in a lake. Peter, what do you think of the tangs on these swords? I've only seen them in pictures, and they look awfully fragile, but I don't think I've ever seen a side view of one. It is great to see a thread like this develope. I will just post some links to sites for those who would like to look at more pictures. About picture 30 and 31 are La Tene period, then I think there is another one about 43. Unsure about 32, the threaded pommel cap thing is very similar to ones found on known roman swords. This is a gallery of photos from the British Museum and 12-22 all have photos of La Tene swords. Also try out the British Museum's compass search. They don't have photos of everything, but a search for "sword" will bring up wonderful results. The Hod Hill sword will come up along with the Kirkburn and Isleham swords. Not to mention some of the best photos of the sutton Hoo sword, the Crundale pommel, and the Fulham sword. Very great resource offered by the British Museum. This thread really has me looking forward to getting my custom La Tene which could be here any time now. 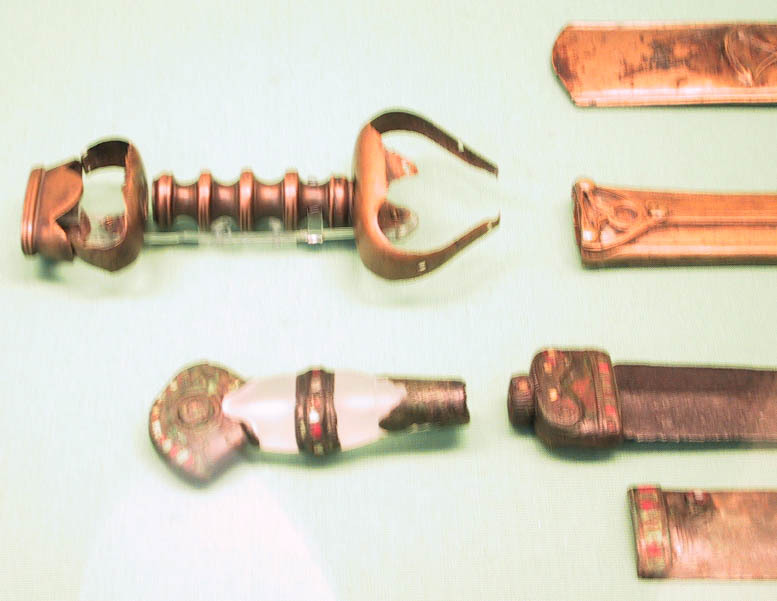 I've been looking at the bronze hilt fittings (the sword with the bronze grip), were these fittings held on by small nail/tacks? I'm guessing that they were iron because I don't see them in the picture. Also, how durable would these multi-componet hilts have been? Rick Barrett sent his copy of Manfred Sachse's Damascus Steel home with me tonight to show my wife, and I happened upon something pertaining to this subject. In it he has nine cross-sectional drawings (from the work of Joachim Emmerling) showing different blade compositions of La Tene swords. It would be nice if it differentiated between which layers are iron and which are steel, but in most it would not be hard to pick out which one would have been which. I'm not familiar with the work of Joachim Emmerling, but I'll check into it when I can to see what I turn up. 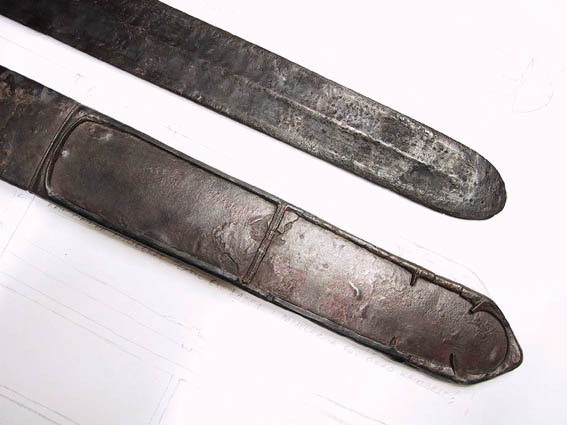 Also pictured is the cross-section of six types of seax blades and ten early medieval blades. So that I have these for personal reference I plan to draw them out before I return the book, if someone will keep after me I will try and post my drawings by the end of the week. By Thursday my wonderful wife will be able to check out books from Notre Dame, and she found out that (while looking for me a copy of The Celtic Sword for our anniversary) that they have a copy. So unless by some fluke someone has it checked out already, I should have it to pour through this weekend. There happened to be a few La Tene period things listed in the auction 45 under the "European Excavated Antiquities." However I recall that auction 44 had quiet a bit of stuff including swords, helms, and spears. Some cool falcatas pictured there as well. I'll post more once I get the copy of The Celtic Sword in my paws. I noticed one of the swords above has a mixed grip with leather(?) (if I haven't just mistaken what I'm looking at). How difficult would it have been to keep this from getting slippery in certain weather conditions, given leather's propensity to absorb wet, mould, sweat, etc and crack? What sort of conditioners would have been used to prevent that sort of occurence? What sort of conditioners would have been used to prevent that sort of occurence? Beeswax has traditionally been used to waterproof and protect leather. I don't know if that's what was used on sword grips back then. If it's applied in the right amount it would give a good grip even when wet. Heat would tend to soften it and you'd probably get some wax on your hand but it wouldn't rot and water wouldn't soak in. In additiion to the beeswax already mentioned, neatsfoot oil and lanolin have been used as leather conditioners, givng good protection against cracking. I've found, with leather as with wood, that sweat and oil from your own skin can have a fairly good effect (which is reasonable I suppose, given that they probably aren't too damaging to your own untanned leather). I'm told that horse urine is good for softening leather, but I've never tried it. Welcome. Just which sword are you referring to?